You are here: Home / Blog / Is an iPad heavy ? Not for me. Is an iPad heavy ? Not for me. A number of “pundits” (who probably did liberal arts degrees and don’t know what a textbook is) have commented that the iPad is too heavy. Like all things, your actual experience depends on your own situation. I have specifically prepared the following comparison to demonstrate that the iPad is much, much lighter than you might think. Which one of these is heavier than other ? The iPad doesn’t particularly weigh more or less than a book does. A 300 page trashy novel is less, but a good sized paperback at 600 pages weighs about the same. A Cisco textbook typically weighs a LOT more. Nice! I can’t wait to get my hands on one myself. How is the study experience on the iPad? It’s a bit early to tell but so far I’m positive. Once I’m clear I’ll write something up. 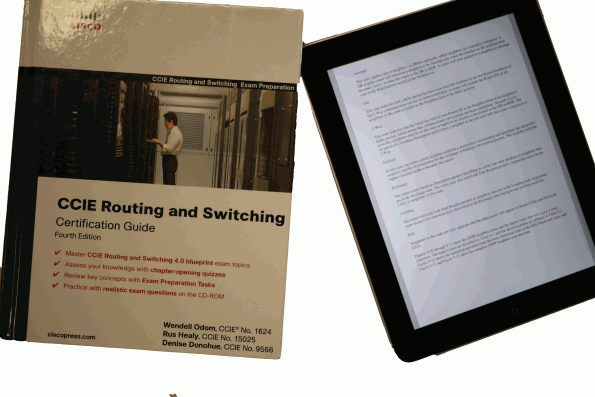 Hey Greg – does the ipad work well with Cisco Press books like the CCIE one ? No and Yes. My advice: Cisco Press (Pearson) use Adobe DRM which is not compatible with the iPad or any computer in the world due to the fact that Adobe DRM is crap software that crashes often. The good news is that you can buy the PDF version from O’Reilly Safari Books Online to be able to load the PDF file into iBooks or use GoodReader (which is what I use). The O’Reilly version has no DRM (but does have watermarking) and makes it usable on every platform. Are you reading Cisco Press books on it? I got the iPad with the thought of *possibly* reading certification books on it with the Kindle app. I’ve been holding off on buying a Cisco Press book because I haven’t decided if I’m keeping the iPad. I have a Kindle too but the diagrams were difficult to see and zooming was cumbersome. So far I’ve been using Evernote to sync my certification notes and I also dropped the Packetlife protocol cheat sheets into Evernote and they render well on the iPad. I’ve found that if I keep my expectations of the iPad in check – i.e. not thinking about it as a horribly crippled general computing device – that I enjoy it more and am more inclined to hold onto it. yes. I have been buying the PDF version from Safari http://safari.oreilly.com and using GoodReader on my iPad to view. I refuse to use Kindle because of DRM, if I can’t take my books to another piece of hardware or software, I won’t buy them. I’ll write something about this shortly. And of course if you get tired of reading ciscopress junk on it, you can always install windows 95 on the ipad.